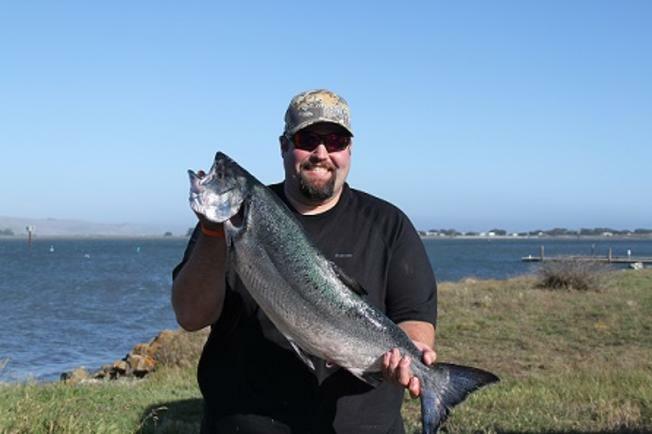 CDFW Environmental Scientist and Ocean Salmon Project team member James Phillips, holding a Chinook salmon. CDFW photo by Kristie Amtoft. State wildlife officials say Northern California fishermen could be treated to an abundant salmon season this fall, despite the lingering drought. The Department of Fish and Wildlife said Thursday its forecast includes a strong return of more than 650,000 adult king salmon from the Sacramento River and more than 420,000 adult salmon from the Klamath River. The Klamath and Sacramento River salmon runs bring in most of the salmon entering California’s ocean and inland fisheries. The Santa Rosa Press Democrat says the forecast represents about an 18 percent increase from a year ago. Commercial and sport anglers say the outlook is good, particularly given their experiences in 2008 and 2009, when low salmon stocks cancelled the commercial season entirely. The California Department of Fish and Wildlife says that salmon numbers are promising in 2015 because this year’s salmon were hatched 2 to 4 years ago. This year’s salmon are old enough to avoid the full impact of the drought. But starting next year, the Department of Fish and Wildlife expects the drought will have a more noticeable impact on fishing opportunities.